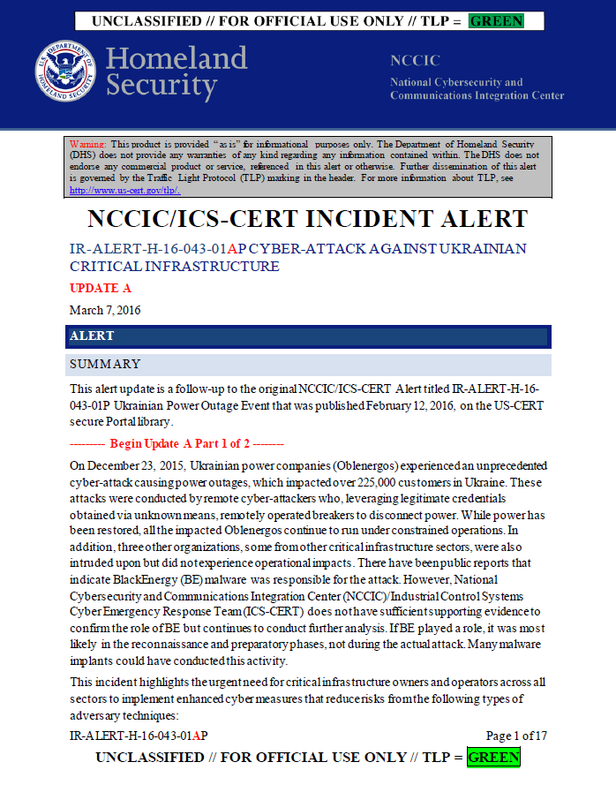 This alert update is a follow-up to the original NCCIC/ICS-CERT Alert titled IR-ALERT-H-16-043-01P Ukrainian Power Outage Event that was published February 12, 2016, on the US-CERT secure Portal library. On December 23, 2015, Ukrainian power companies (Oblenergos) experienced an unprecedented cyber-attack causing power outages,which impactedover 225,000 customers in Ukraine. These attacks were conducted by remote cyber-attackers who, leveraging legitimate credentials obtained via unknown means, remotely operated breakers to disconnect power. While power has been restored, all the impacted Oblenergos continue to run under constrained operations. In addition, three other organizations, some from other critical infrastructure sectors, were also intruded upon but did not experienceoperational impacts. There have been public reports that indicate BlackEnergy (BE) malware was responsible for the attack. However,National Cybersecurity and Communications Integration Center (NCCIC)/Industrial Control Systems Cyber Emergency Response Team (ICS-CERT) does not have sufficient supporting evidenceto confirm the role of BE but continues to conduct further analysis. If BE played a role, it was most likely in the reconnaissance and preparatoryphases, not during the actual attack. Many malware implants could have conducted this activity. • Use of Telephone Denial of Service (TDoS) to disrupt operations and restoration. This report is being shared for situational awareness and network defense purposes. ICS-CERT strongly encourages organizations across all sectors to review and employ the mitigation strategies and detection mechanisms contained within this report. An interagency team composed of representatives from the NCCIC/ICS-CERT, U.S. Computer Emergency Readiness Team (US-CERT), Department of Energy,Federal Bureau of Investigation, and the North American Electric Reliability Corporationtraveled to Ukraine to collaborate and gain more insight. The Ukrainian government worked closely and openly with the U.S. team and shared information to help prevent future cyber-attacks. The following account of events is based on the interagency team’s interviews with operations and information technology staff and leadership at six Ukrainian organizations with first-hand experience of the event. The team was not able to independently review technical evidence of the cyber-attack; however, a significant number of independent reports from the team’s interviews, as well as documentary findings, corroborate the events as outlined below. Through interviews with impacted entities, the team learned that power outages Ukraine experienced on December 23, 2015, were caused by remote cyber-attacks at three regional electric power distribution companies (Oblenergos), impacting approximately 225,000 customers. While power has been restored, all the impacted Oblenergos continue to run under constrained operations. In addition, three other organizations, some from other critical infrastructure sectors, were also intruded upon but did not experience operational impacts. The team assesses that the attacks against the Oblenergos demonstrated some Tactics, Techniques, and Procedures (TTPs) that,while previously known, have not been previously observedin an actual cyber-attack. The cyber-attacks were reportedly synchronized and coordinated, probably following extensive reconnaissance of the victim networks. After gaining a foothold in the victim networks, attackers acquired legitimate credentials and leveraged valid remote access pathways to conduct their attack.The physical impact events of the cyber-attacks launched within 30 minutes of each other, impacting multiple central and regional facilities. Over 50 regional substations experienced malicious remote operation of their breakers conducted by multiple external humans. This was done using either existing remote administration tools at the operating system level or remote ICS client software via virtual private network (VPN) connections. All three impacted companies indicated that the actors wiped some systems by executing the KillDisk malware at the conclusion of the cyber-attack. The KillDisk malware erases selected files on target systems and corrupts the master boot record, rendering systems inoperable. It was further reported that in at least one instance, Windows-based HMIs embedded in remote terminal units were also overwritten with KillDisk. The actors also rendered Serial-to-Ethernet devices at substations inoperable by corrupting their firmware. In addition, the actors interrupted power to some data centers through scheduled power outages on server UPS via the remote management interface. The team assesses that these actions were done in an attempt to interfere with expected restoration efforts. Initial intrusion appears to have been through malware,which was delivered via spear-phishing emails with malicious Microsoft Office attachments.While it has not been confirmed with technical artifacts, it is probable that the two events are related. While the cyber-attack has been widely attributed to BE in the open press, any remote access trojan could have been used in these attacks, and none of BE’s unique capabilities were leveraged. At this time,no definitive link can be drawn between the outage and the presence of the BEmalware, however analysis is ongoing. (U//FOUO) This Assessment establishes a baseline analysis of cyber threats to the US energy sector based on comprehensive FY 2014 incident reporting data compiled by ICS-CERT, as well as reporting by the Intelligence Community (IC), private sector cybersecurity industry, and open source media between early 2011 and January 2016. This Assessment is designed to help close gaps between the private sector’s and the IC’s understanding of current cyber threats facing the US energy sector. Critical infrastructure owners and operators can use this analysis to better understand cyber threats facing the US energy sector and help focus defensive strategies and operations to mitigate these threats. The Assessment does not include an in-depth analysis of foreign cyber doctrines or nation-state red lines for conducting cyber attacks against the United States. The information cutoff date for this Assessment is January 2016. 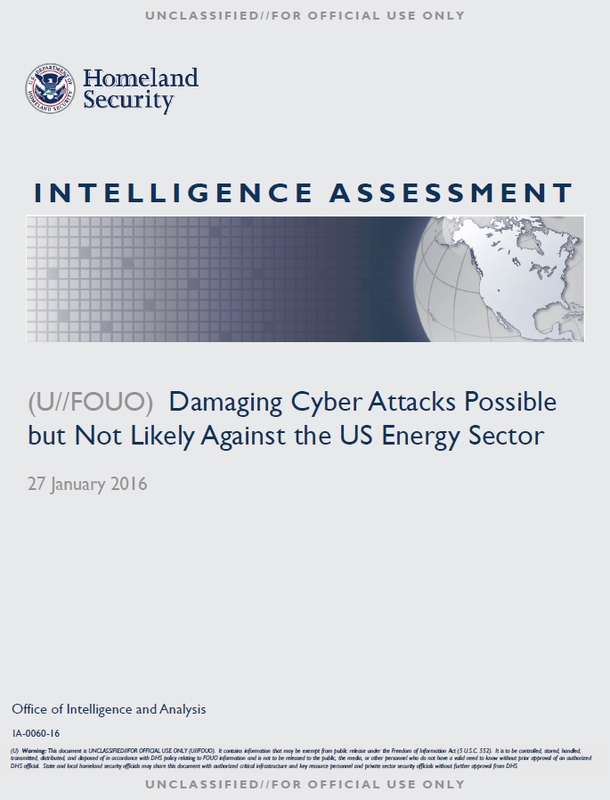 (U//FOUO) We assess the threat of a damaging or disruptive cyber attack against the US energy sector is low. We judge advanced persistent threat (APT) nation-state cyber actors are targeting US energy sector enterprise networks primarily to conduct cyber espionage. The APT activity directed against sector industrial control system (ICS) networks probably is focused on acquiring and maintaining persistent access to facilitate the introduction of malware, and likely is part of nation-state contingency planning that would only be implemented to conduct a damaging or disruptive attack in the event of hostilities with the United States. (U//FOUO) We assess the majority of malicious activity occurring against the US energy sector is low-level cybercrime that is likely opportunistic in nature rather than specifically aimed at the sector, is financially or ideologically motivated, and is not meant to be destructive. (U//FOUO) We assess that imprecise use of the term “cyber attack” in open source media reporting and throughout the private sector has led to misperceptions about the cyber threat to the US energy sector. (U//FOUO) We assess the threat of a damaging or disruptive cyber attack against the US energy sector is low. We judge APT nation-state cyber actors are targeting US energy sector enterprise networks primarily to conduct cyber espionage. The APT activity directed against sector ICS networks probably is focused on acquiring and maintaining persistent access to facilitate the introduction of malware, and likely is part of nation-state contingency planning that would only be implemented to conduct a damaging or disruptive attack in the event of hostilities with the United States. (U//FOUO) We assess imprecise use of the term “cyber attack” in open source media reporting and throughout the private sector has led to misperceptions about the cyber threat to the US energy sector. The term “cyber attack” is frequently used to refer to any cyber incident directed against the US energy sector. This overuse of the term “cyber attack” creates an unnecessarily alarmist general view of the threat to the sector. “Cyber attack”—which should denote intent to cause denial, disruption, destruction, or other negative effects—is frequently used in the private sector to describe cyber espionage, and even low-level, untargeted incidents of cybercrime. Overuse of the term “cyber attack,” risks “alarm fatigue,” which could lead to longer response times or to missing important incidents. The U.S. government last week said that two cyberattacks on the agency compromised more than 21 million Social Security numbers, 1.1 million fingerprint records, and 19.7 million forms with data that could include a person’s mental-health history. “I don’t expect this to be a one-off,” said Navy Adm. Mike Rogers, who heads the NSA and the U.S. military’s Cyber Command. Cyber Command, though responsible for protecting Defense Department networks, wasn’t charged with defending the Office of Personnel Management’s system, he added. Director of National Intelligence James Clapper last month said China is suspected to be behind the hack. Adm. Rogers likened the hacking of U.S. government records to last year’s attack on Sony Pictures Entertainment, which revealed sensitive company information. He said such events required a governments and companies to step back and review procedures. Adm. Rogers was speaking at the London Stock Exchange as part of an outreach effort to the financial sector to raise awareness of cybersecurity threats. “We are in a world now where, despite your best efforts, you must prepare and assume that you will be penetrated,” he told the group. “It is not about if you will be penetrated, but when,” he said. David Omand, the former head of the U.K. Government Communications Headquarters, said at the event that the average cost of a breach on U.S. companies is around $20 million. U.K. figures suggest a lower cost, though he said those may be too conservative. (U//FOUO) We assess that the primary cyber threat to US university and college networks is cybercrime and unwitting hosting of malicious activity, likely because the regular turnover of student network users and requirements for accessibility to the networks make the networks difficult to monitor and secure. (U//FOUO) We assess malicious cyber actors targeting intellectual property and research are the emerging cyber threat facing university and college networks. Cutting-edge research and sensitive US government and cleared defense contractor projects are appealing targets for cyber actors looking to gain access to sensitive research programs and information. (U//FOUO) Malicious cyber actors have targeted US universities and colleges with typical cybercrime activities, such as spear phishing students and faculty with university-themed messages, creating fake university websites, and infecting computers with malicious software, likely in an attempt to gain access to student and faculty e-mail and bank accounts. We have no indication that cybercriminals target university systems and users more than any other cybercrime victims. » (U//FOUO) According to sensitive DHS reporting, several different types of malware designed to gather personally identifiable information (PII) and exploit computer systems for financial gain—ransomware, clickfraud malware, and credential-harvesting malware—were found on computer systems of an identified US university in late August 2014. We do not know if PII was compromised or exfiltrated as a result of these infections. » (U//FOUO) In February 2014, unknown cyber actors targeted departments at an identified US university with phishing messages containing malicious links, according to FBI reporting. Computers of recipients that responded were infected with ransomware requiring victims to pay between $50 and $500 to decrypt their computers, according to FBI reporting. » (U//FOUO) In early 2014, malicious cyber actors successfully executed an e-mail phishing attack against 166 employees at an identified US university. The phishing message was embedded with a malicious link to a fraudulent university website that, when accessed, prompted employees to provide PII associated with their financial accounts. The actors successfully compromised the financial accounts of two employees, changing their direct deposit information so that money was delivered to an unspecified US bank, resulting in financial losses for the employees, according to an FBI contact with excellent access. (U//FOUO) US universities and colleges have extensive computer networks and infrastructure making them ideal targets for unwitting hosting of malicious cyber operations, including denial-of-service (DoS) attacks and undetected storage of malware. As with cybercrime, we have no indication that malicious cyber actors target university and college networks for these activities any more than other networks. » (U//FOUO) In early 2014, an unidentified cyber actor leveraged a supercomputer at an identified US university to initiate a DoS attack against the servers of several identified US businesses that host servers for gaming activities, according to an FBI source with indirect access. The attack used about 98 percent of the university’s bandwidth. » (U//FOUO) Unidentified cyber actors used a named US university’s web server as a file repository for distributing malicious tools, according to sensitive DHS reporting. Analysis of the web server confirmed that a number of malicious tools had been uploaded to the system, as of mid-2014. 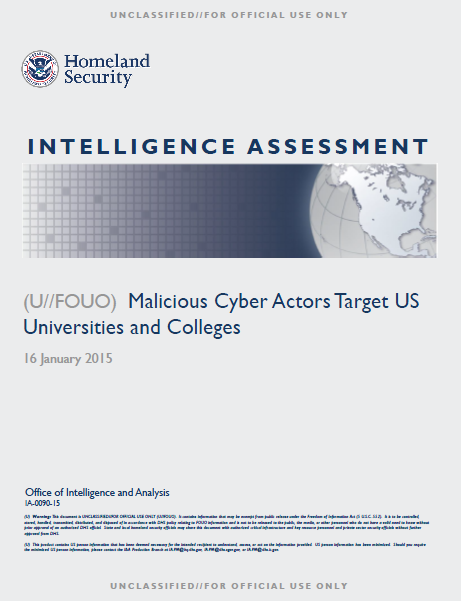 (U//FOUO) While malicious cyber actors looking to exploit university and college networks for PII remain a consistent threat, we assess that the emerging cyber threat facing US university and college networks is cyberespionage actors seeking information and intellectual property. In addition to in-house, cutting-edge research, numerous US universities and colleges are involved in sensitive US government and cleared defense contractor research projects. These associations are very appealing to cyberespionage actors looking to gain access to sensitive research programs to exfiltrate information. University networks, which often have multiple levels of connectivity and accessibility to fuel collaboration, may present an easier target for cyberespionage actors than sensitive government or private industry networks. We have only a few examples of data exfiltration from university networks, but those we have lead us to judge that this activity does target research information and intellectual property. » (U) According to reporting from a US cybersecurity firm, likely Iranian cyber actors, as part of a global espionage campaign, targeted universities in the United States, India, Israel, and South Korea from 2012 to late 2014. The cyber actors targeted research efforts, student information, student housing, and financial aid systems. According to the security firm, the cyber actors reportedly harvested confidential critical infrastructure documents from major educational institutions around the world. » (U) A late-2013 review of the infrastructure associated with a probable foreign cyberespionage campaign indicated broad targeting of university computer systems, including those in the United States, the United Kingdom, and Israel, according to DHS reporting. The unknown actors successfully exfiltrated sensitive research information associated with university-affiliated medical organizations, including passwords and passport images. he following bulletins were released in late May by the FBI to private industry partners and discuss attempts by malicious cyber actors to exploit government and private industry networks and employees, including their family members, using targeted campaigns involving false personas on various social media platforms. The bulletins were originally posted on the website of The Security Awareness Company. It is advised that industry use due diligence to inform and educate their associates on the vulnerabilities associated with the use of social networking sites. (U) The FBI and NCIS believe a group of cyber actors have been using various social networking sites to conduct spear phishing activities since at least 2011. FBI and NCIS investigation to date has uncovered 56 unique Facebook personas, 16 domains, and a group of IP addresses associated with these actors. These personas typically would attempt to befriend specific types of individuals such as government, military, or cleared defense contractor personnel. After establishing an online friendship the actor would send a malicious link (usually through one of the associated domains) to the victim, either through e-mail or in a chat on the social networking site eventually compromising the target’s computer. While this FLASH specifically deals with Facebook personas, it is believed that many of these personas also maintain a presence on other social networking sites such as LinkedIn, Google +, and Twitter which are just as malicious. This group of cyber actors also has created and maintained multiple malicious Web sites, often spoofing a legitimate Web site and implanting malicious links into the actor’s version of the Web site.